Is it too late for THE NAMESAKE to be considered the next big thing? See, my YA novel, THE NAMESAKE, technically released in early 2013, but it doesn’t seem fair to rob my protagonist, Evan Galloway, of his shot at 15 minutes of Next-Big-Thingness. Does it? Well, I hope not. And fellow YA author, Beth Fehlbaum, clearly didn’t think so either, because she graciously tagged me to talk about THE NAMESAKE here. Be sure to check out Beth’s site to find out about her upcoming Merit Press release BIG FAT DISASTER. She recently blogged about her own NEXT BIG THING here! Well, back when I was actually working on it, my book was called JUNIOR. The reason is that Evan’s dad was also named Evan. The fact that Evan’s not quite a Junior (they have different middle names) comes into play in the book. Even so, I thought JUNIOR was a pretty lame title, and when Macauley Culkin published a novel with that name, I figured it’d have to change. When Merit Press bought the ms, they asked for a title change. My wonderful agent, Victoria Marini of Gelfman Schneider Literary Agency, and I brainstormed a bunch of new names including In the Wake of Paper Boats and The Sweet Bitter. Eventually, Merit rechristened it THE NAMESAKE. I was actually kind of bummed to have a “used” title. After all, who hasn’t heard of the Jhumpa Lahiri sensation? But I’ve come to terms with it; it fits the story nicely. I can only hope my novel will one day be as popular as Ms. Lahiri’s. Evan’s story began in response to family tragedy. My cousin took his life at forty-seven, and it got me thinking what it would be like for a teenager whose parent makes that awful choice. I was in my first masters class at Wesleyan at the time, Studies in Adolescent Fiction, and I took the opportunity to write a few representative chapters, which became the first chunk of THE NAMESAKE. In what genre does your book fall? THE NAMESAKE is gritty, contemporary realistic YA. I’d call it fairly dark and mature YA, due to the content. Evan goes on a journey of discovery to understand his father’s past – and why he killed himself. The realities of his father’s life are pretty heavy. Luckily, Evan has a strong sarcasm gene, and an outrageous best friend named Lex, so there’s plenty of humor to temper the heavy emotion. Following his father’s suicide, Evan Galloway, a talented artist and A student, struggles to rebuild a life he fears may never include a happily-ever-after. Book blogger Subtle Chronicler recently cast The Way Way Back’s Liam James as Evan Galloway. I agree he’d be a great choice. He has a wonderful regular-kid honesty and a great soulful quality that would really suit Evan. Bonus: Toni Collette, who played the mom in TWWB would also be amazing as Evan’s mother. Check out The Subtle Chronicler‘s feature! Who is publishing your book? I wrote on and off for about five years, actually, while earning my masters, working full time and teaching part time. I’m definitely a “pantser,” but I also write sort of methodically, refining word-by-word as I go, rather than churning out a sloppy first draft. It’s not the quickest mode of writing, but it works for me. Of course, I now teach fulltime and have a part time job, but I intend to write my next book much more quickly. That’s a tough one. I think my book has some of the same emotional resonance as SPEAK, by Laurie Halse Anderson. It’s also been compared to The Catcher in the Rye and the work of John Green. Very flattering, indeed! As I said, my cousin’s suicide got me started writing. The story, however, isn’t at all based on my cousin. Many of the details, though, are stolen from my own life. Evan and I are both artists, honors students and “good Catholic kids”; the school in THE NAMESAKE is certainly inspired by my high school. And Randy Spiotti, Evan’s bully, bears a strong resemblance to my own high school tormentor. As I mentioned, there is a lot of humor in the book, some of which comes courtesy of the Alberti family. They’re an Italian clan who run a restaurant where Evan ends up working. Readers have called THE NAMESAKE mysterious and emotionally devastating as well as really funny, so anyone who enjoys an honest and unflinching emotional portrayal—leavened by humor and snappy pop-cultural references—should check it out. Speaking of checking out writing with emotional honesty and snap, it’s my great honor to tag two wonderful fellow authors and good friends, Kim Stokely, whose historical novel Woman of Flames is coming out soon, and N.A. Nelson, award-winning author of Bringing the Boy Home, who’s hard at work on some great new YA fiction. Take a look at their sites for information on their amazing work. Here’s Kim Stokely‘s Author site! And here’s N.A. Nelson‘s site! Well, that ties it up for me. Thanks again, Beth, for tagging me. And thanks, everyone, for visiting! Be sure to leave a comment. 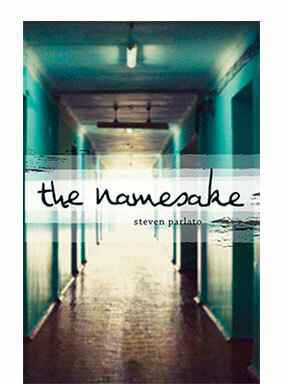 Everybody who comments by midnight Sunday will be entered in a drawing to win a signed copy of THE NAMESAKE. I loved reading this, especially the part about choosing a title (I remember when it was Junior). The Wake of Paper Boats should be the title of your next book no matter if it has paper boats in it or not! Love that! Thanks, Nina! And thanks for all the support and inspiration, stretching back to the Junior days! I like The Wake of Paper Boats, too. Maybe it’ll end up as a poem title one day. Looking forward to your NEXT BIG THING! Thanks for sharing this, Steven–it was great to hear more of the background of your story! I absolutely agree that it was both emotionally devastating and hilarious. I have no idea how you balanced those elements so perfectly, but it was seriously impressive! Thank YOU, Faith, for checking in – and for the kind words. I’ll be posting another blog on writing about tough stuff in the next couple of days. Be sure to check it out, and I’ll be sure to put your name in for the signed copy drawing. Oh, and CONGRATULATIONS on your Tassy honor for Cirque! Thanks for the background info of your story. I love knowing how a story came to be. I am a bit ashamed to admit I have yet to read your book, but I know several people who have (your sister being one) and they highly recommend it. Read two books this summer, and yours will be my third. Congratulations on your first book! Love your one sentence synopsis! Intriguing! Thanks, Yvonne! I tried to come up with something new, and brevity is not typically my strength, so it’s good to hear it worked! It is great to understand the unraveling process of your book. I know I am sometimes very attached to titles and ” in the wake of paper boats” is pretty darn good lol. But “The Namesake” was rightfully chosen like a pair of expensive shoes that may seem to tight but instead hug your foot and give you nothing but support. I love this books and am happy to say I just checked it out again from a local library for some summer reading! Thanks so much, Ashlyn! Great to hear from you, and I’m honored to be a repeat read. I love the expensive shoes analogy! All best! It’s wonderful watching the progression of your writing career, after so many years of hard work and excellent prose and verse! Thanks so much, Mandy, for your sweet comment – and for support and encouragement spanning all those years! I’m just going to comment to support you, and also to try and win your book for my friend, Tommy! 🙂 I can’t wait to read the next novel (and the one after that)! Samantha, You’re too kind. But thank you! And you got in just under the wire. I’ll enter your name in the now-officially-closed contest. 🙂 Good luck (Tommy)! Many thanks to everyone who left a comment. My “assistant,” the lovely Jillian Lucia Parlato, picked a name from the prize bowl, choosing Faith Hough as the winner of a signed copy of THE NAMESAKE! your RSS feed to my Google account. I look forward to brand new updates and will share this website with my Facebook group. Thanks, Yvonne! I really appreciate your note of support. No “donate” button, but feel free to stop by anytime, and if you like my blog writing, you might really enjoy THE NAMESAKE (hint, hint).